Andraschko Coffee will always have a special place in my heart: their “Wiener Kaffeehaus Mischung” Espresso blend is the coffee that actually made me like coffee. Andraschko is a family-run speciality coffee roastery whose founders frequently travel to see the coffee farmers they work with and to discover new coffees, a philosophy they call “from crop to cup” which I think deserves to be supported. 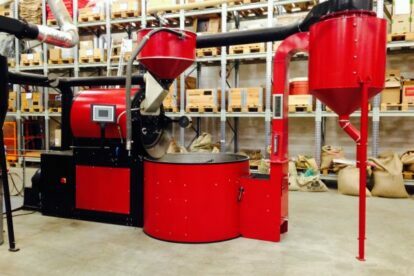 There is a list of retailers on their website, however I highly recommend visiting them at their roastery in Tempelhof. The location is in an industrial area about a 25 minute walk away from the u-bahn station Ullsteinstraße. To be quite honest I think it is a little ugly from the outside – I nearly walked past it the first time I visited – but don’t be fooled. Once inside you will have a view on the whole production process and there is usually a delicious smell of roasted coffee in the air. The last time I was there I was able to taste several different blends, so if you are unsure which one to buy do not hesitate to ask. All employees I have met so far are very friendly and enjoy talking about all aspects of coffee and you can buy all sorts of coffee making equipment you are still missing.